Going into this I was intrigued by the idea of a retelling of the Romeo & Juliet story. I have mixed feelings about the original story. I know it's hailed all over the place for being the best tragic romance and all that, but while I don't hate it, I've always kind of felt like it was telling the story of a couple of really naive and irrational teenagers. Regardless, I had no idea what to expect with this story, but I was very pleasantly surprised with what I got. 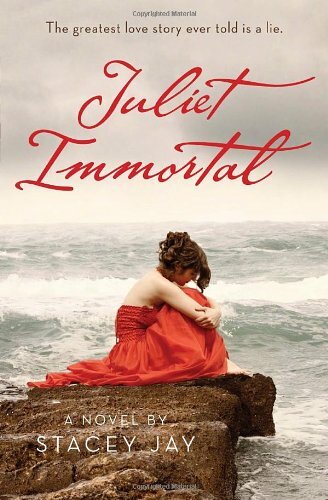 I love the evolution of the character of Juliet that is in this story. She is no longer a sweet, naive girl. She is strong, angry and wants revenge for what was done to her. She's by no means perfect, but she is definitely a fighter. I like that Stacey Jay has taken a literary character that was so wholly dependent on the love of her man and made her into an independent and tough girl. I'd like to see Claire Danes and Leo DiCaprio play these versions of Romeo and Juliet. Romeo, quite frankly, creeped me out. Even when he wasn't being outright evil, he just gave me the skeevies. I could picture his smug smirk and shifty eyes. Not a guy I'd want in my homeroom. He grew on me a little by the end, but I'm still not sure about his true intentions. The girl who Juliet inhabits, Ariel, has some interesting people in her world. She has very low self esteem, due to some very visible scars, so she doesn't have a lot of people around her. Melanie, her mother, clearly loves her but isn't really great at loving her for who she is. Her best friend Gemma is crazy bossy and harsh, but deep down she's got some things that make her less than cuddly, too. Ben was just a really sweet character and despite his past, a good guy. I don't know if the author is planning this to be a series, but the end was left just open enough that I would be interested to see where she might take the story. Of course, it was also satisfying enough to be a stand alone. Well done, Miss Jay!